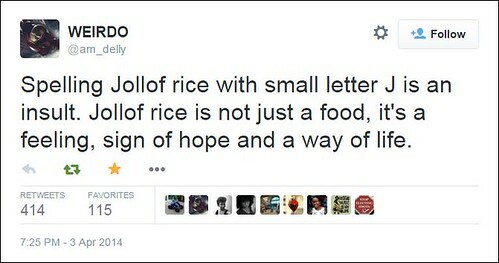 Jollof Rice – proudly West African. Revered and celebrated sub-continent wide. There is a lot of argument from East to West about whose Jollof Rice is the best. I find it a question of little consequence. 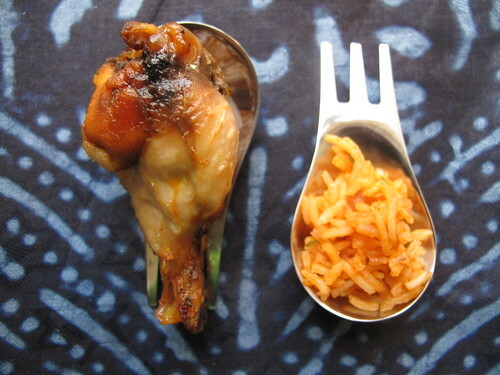 I believe that each country has a unique offering and interpretation of Jollof even though the basic ingredients remain the same: rice, tomatoes, onions, scotch bonnet peppers and spices. There is some consensus that Jollof rice is an ancient gift from the Wolof – an ethnic group across Senegal, The Gambia and Mauritania. A gift that has its seeds sprinkled, like fine grain along the coast of West Africa. The Wolof Empire was a medieval West African state that ruled parts of Senegal and the Gambia from approximately 1350 to 1890. By the end of the 15th century, the Wolof states of Jolof, Kayor, Baol and Walo had become united in a federation, with Jolof as the metropolitan power. Thus, it isn’t hard to imagine a dish of this importance named after the ‘power’ – Jolof. At that time, the region – from the Gambia River to Liberia was also known as the Grain or Rice coast because rice, millet and other grains were farmed grown along the banks of the Senegal River. Judith A. Carney in her book, ‘Black Rice, The African Origins of Rice Cultivation in the Americas’ writes of the Senegal River as being an established Portuguese trading port where goods and services were exchanged. It is possible that home-grown rice was combined with foreign food staples like tomatoes from the New World to birth Jollof rice. 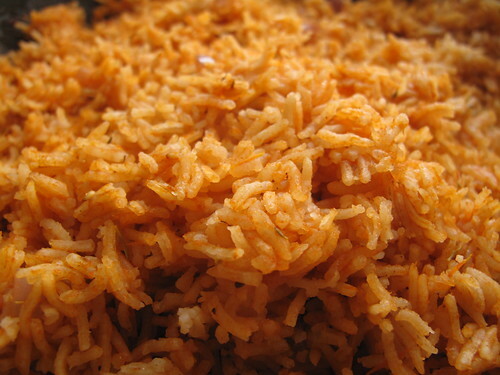 Is it surprising that in Senegal – its home, Jollof Rice doesn’t go by the name? Instead it is called Thiéboudienne or Ceebu jën, often cooked with fish. According to oral tradition, Thiéboudienne is the creation of one woman from Saint Louis, Senegal. Penda Mbaye, a cook at the colonial governor’s residence, created the dish of fish and vegetables first using barley. Amid a barley shortage, she decided to use rice, at the time still a luxury good having just arrived in Senegal by way of Asia in the 19th century. 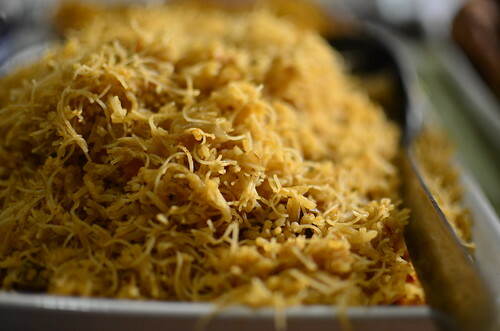 Eventually Thieb became a favored dish throughout Senegal and was elevated to national dish status. 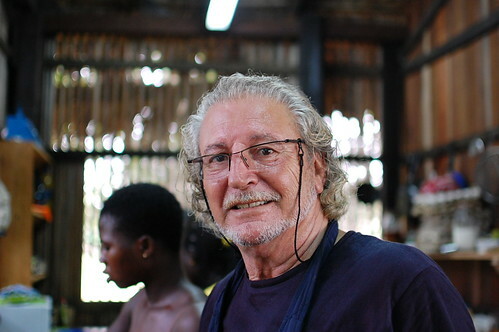 James McCann in his 2009 book ‘Stirring the Pot: A History of African Cuisine’ writes ‘The dish’s prevalence in urban settings throughout West Africa suggests a further compelling hypothesis: that Jollof rice was a food introduced throughout West Africa by a quite familiar cultural dispersion left over from the old Mali empire. …Djula people…found in almost all West African commercial centers, were a trade diaspora who established cultural enclaves in areas as widely dispersed as the variations of Jollof rice itself. Could it have been that trade paved a new path for the culinary history we know today? I can imagine travelling salesmen referring to a dish, a recipe by its source, by its origins,…so hypothetically, Jollof could have gotten its name from men of commerce. Makes sense to me :). Interestingly, the best Jollof rice I ever tasted was on the banks of Lake Tadane in the Amansuri Wetlands of Ghana. Cooked by a Spaniard at the Café Puerto and surrounded by spectacular scenery – a silver stretch of water, green lily pads blooming with creamy lilies and green trees arched as gateways. The Jollof rice arrived red and fragrant as could be. 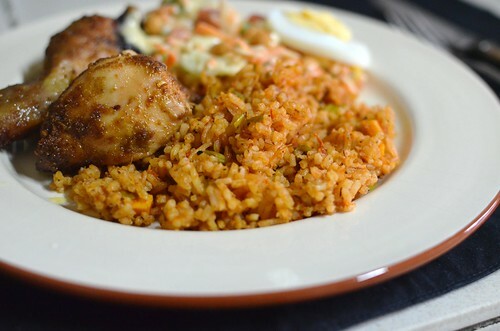 Contrary to the Nigerian Jollof which typically uses long-grain rice, this was made with Thai Jasmine – sweet and soft. It appeared stir-fried, as opposed to ‘stewed’ and I believe that Ghanaian ‘mother’ seasoning (of green chilies, fresh ginger and onions) was used. It was awesome. And one variation of them. 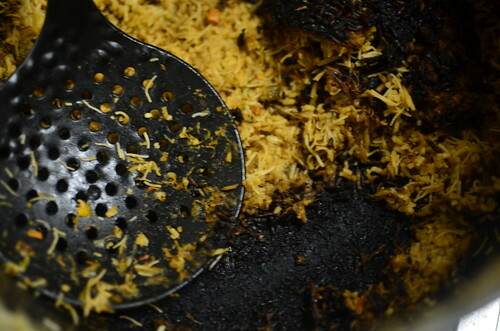 Still, there is Gambian Benachin or benichi to try, which usually has dried or smoked shrimps/prawns and Thiéboudienne. 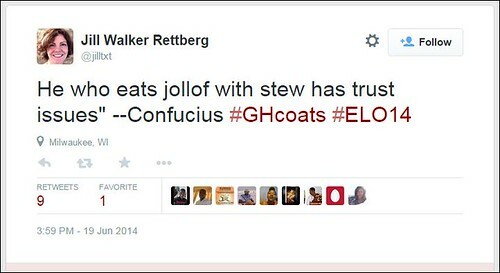 And of course, there is Nigerian Jollof Rice which I ‘grade’ in my head. First up, there’s regular Jollof – cooked at home, on the stovetop or in the oven (especially in diaspora) – very nice but regular. And then there’s ‘Party Jollof’…the real deal – smoky rice, often cooked in a cast iron pot over firewood – orange and well-spiced. Until a few months ago, I’d moaned about my inability to recreate the smoky flavours of Party Jollof. Up till last December when I realised you could get the same effect from deliberate and controlled ‘burning’ of the rice. On the stovetop. Because there is no better way to Jollof than the Party way. What’s your favourite Jollof Recipe?